Britain, Spain, and France are carving up the Caribbean with the thunder of cannon. Fleets lay siege to ports bursting with wealth, eager to claim them for King and Country. The sea burns with the fires of glory. From the haze of battle emerges the Black Flag, and into the chaos plunge pirates, bold and resolute. This is your world now, a world of battle and intrigue, and you will captain your ship through the pages of legend! Comment: Very much like a pirate game is good. Comment: This game is pretty good, the graphics are great, gameplay is smooth, community is a nice size. 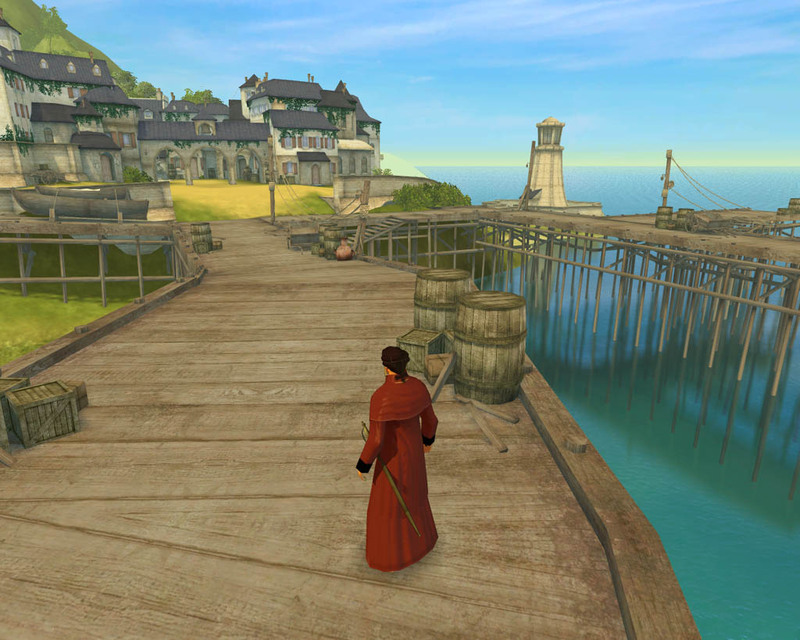 Comment: I agree with the population, pirates are over populating, but overall the community is good and gameplay is brilliant, and now its free which will get more viewers, the graphics are great, the water esspecially looks realistic, and i do not agree it gets boring, sure if you play it constently, but if you play an hour a day, it is definetley not boring! Comment: Not a bad F2P game I guess, but didn't hold my interest. Nothing seemed terribly unique, except for the ship combat which I found boring. Besides, everyone always picks pirate so there's horrible population unbalance. Comment: As of Feb. 2010 the developers are reducing the number of servers from 5 to 2 in order to achieve a "sufficient player density". This is a PvP-centric game. Econ, PvE, RP and non-PvP player is considered irrelevant and the game changes over the past 2 years have reinforced this. The role of non-Pirate non-PvP players especially is to be targets for the Pirate PvP players. This is exacerbated by the fact that if your ship is sunk or captured in PvP combat, you lose it and its cargo. Many exploits and bugs have given a certain group of players millions of doubloons and other resources like ships such that they don't have to worry about losing ships in PvP. Any regular player has to spend weeks grinding NPCs and sailing around to trade resources in order to afford a ship, only to lose it is a few minutes to one of these PvP experts. 19 of 20 people who play this game leave quickly. Atmosphere is more like a low-end pool-room with hustlers on the lookout for "marks" from whom they can score some easy cash. Game had some really good sailing mechanics and artwork (artistic, not realistic, but appropriate for the genre), but very poor combat mechanics both on land and sea. The land combat is OK, as it is generally peripheral to the main play. For the sea combat to be so much like fantasy spell-based combat is inexcusable. For realism, the low-level ship combat against the dumb-AI is far more realistic than the high-level ship combat against other players. Comment: Excellent game. Played during the closed beta. Although the swashbuckling missions were repetitive and way too easy, the ship combat more than made up for it. Definitely give it a try. Comment: Been playing since last week. Need more games like this. Beats World of Borecraft to me because you can do so much more. PvP is a blastand it is cool being a pirate. Comment: Not a WoW clone so not everybody will like it. The launch was delayed thanks to SOE but not by much. Looks awesome to me. Plays a little like some of the free pirates games only better! Comment: The games Graphics are decent, The Ship battles are intense, And thing I like most about the game is when you board a ship you go down to deck level taking control of your character, Only problem with boarding is the enemy AI just rushes and mobs you. I can"t review the Port blockades because I"m to low of a level. Another thing I wish is that the game would COME OUT. I mean they"ve been in beta for what 2 years and alpha for 3 years. Comment: I have myself played in the Beta and i can tell you it is truly a great game. The lifelike features and people make the game much more inviting to play and the ships and crew on the ships are amazing. There are a few downsides though. Like one for example is steering with the A and D keys(Hmmm). If you are looking for a game besides your ordinary fantasy (Runescape) game then i sugest trying this. One thing im not sure on is the realese date. They keep on pushing it back. I think it will come out some time in mid june.